Of all the things I have lost, I miss my mind the most! This seems such an apt saying for me right now. I seem to have lost my memory. I certainly hope that where ever it is vacationing, it is having a good time! Also, I need it back. I think I am being challenged right now as I am so tired. I am just not sleeping well. I woke up ten days ago with a sore throat and since then my sleep has been fitful. It has finally caught up with me, and right now, I could put my head on the desk and catch a quick snooze. Instead, I will have to conquer the day and my tiredness as we have house guests for 2 days. 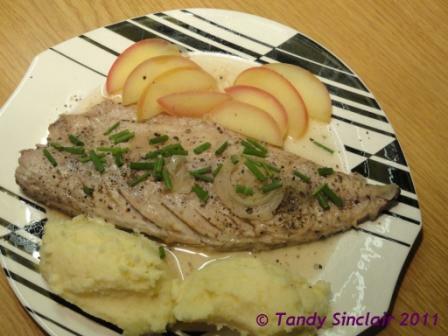 This quick meal using mackerel should be perfect for entertaining! I’m glad you’re feeling better. Sore throats are the worst. I hate not being able to swallow! This sounds excellent, Tandy!! I amglad to hear that you are better!! I love everything horseradish! Some horseradish potatoes sound delicious–yum yum. Although, I’m a huge fan of mashed cauliflower as a sub for potatoes, and that might be even tastier with horseradish! I hope you get a chance to catch up on sleep–but guests tend to make that hard to do. Sorry that you were feeling so under the weather! Glad you all better now. Thank heavens this was written a while back and I don’t have to cancel my trip! I could be VERY ILL and I would not let you cancel! We get a lot of mackerel here but I never really know what to do with it – so this is a great recipe. Also, we´re heading north to Asturias in 2 weeks which is famous for its cider…will have to bring some back with me! Sorry to hear you have not been well Tandy. This recipe sounds delicious and I haven’t eaten fresh mackerel for ages.